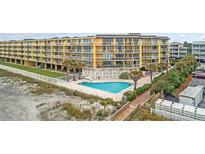 Below you can view all the condos for sale in the Charleston Oceanfront Villas subdivision located in Folly Beach South Carolina. Listings in Charleston Oceanfront Villas are updated daily from data we receive from the Charleston multiple listing service. To learn more about any of these condos or to receive custom notifications when a new property is listed for sale in Charleston Oceanfront Villas, give us a call at 843-306-2224. Listen to the waves crash and watch the pelicans fly by right in front of you as the sun rises from the 200 Square ft. oceanfront balcony off living area and master bedroom MLS#19009379. Dunes Properties Of Chas Inc. This villa has an updated kitchen, access to the balcony from the living room and master bedroom, and a total of 4 bedrooms and 3 full bathrooms. MLS#19002088. Dunes Properties Of Chas Inc. There is an ocean side deck that can be accessed from the great room or the master bedroom. MLS#18030992. Fred Holland Realty.